Experience the by-gone era of train travel on board Via Rails' westbound Skeena line from Jasper to Harvey, British Columbia. Detrain and be met by a friendly, professional driver guide for the trip back to Jasper in a touring vehicles along the historic Yellowhead Highway. Train enthusiasts will appreciate the guide's colourful commentary on the historic role of the railway in the Rockies. Wildlife enthusiasts will enjoy the abundant wildlife and points of interest on this unique Rocky Mountain Adventure. 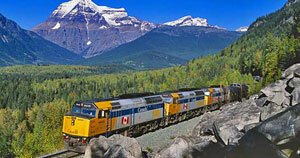 Trains are available travelling west through to Vancouver, and east to Edmonton and across Canada to Toronto. Please contact us direct for details.